INTRODUCTION. “Will I go to jail if I set up an offshore trust?” The short answer continues to be “no” (See, APN Vol. XVII, No. 1, for background on contempt). The more complete answer is “not if the trust is competently prepared and properly implemented” (See, APN Vol. VII, No. 2, for background on the importance of competent counsel). Case in point: the 2014 Bellinger case. BELLINGER CASE. In 2006 the predecessor of the plaintiff bank made a loan to a company Mr. Bellinger was involved in and obtained personal guarantees from him and two others. Although not mentioned in the Court’s decision, the other two individuals had agreed to indemnify Mr. Bellinger should his personal guarantee be called upon. Those individuals had made good on previous indemnifications, and Mr. Bellinger believed that they would continue to honor their agreements. The loan went into default in February 2011, and Mr. Bellinger and the others were sued by the bank on their personal guarantees in May 2011. On November 30th, 2011, Mr. Bellinger created a Cook Islands Trust (“Trust”), funded with approximately $1.7 million in assets. 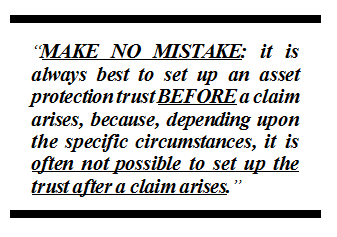 MAKE NO MISTAKE: it is always best to set up an asset protection trust BEFORE a claim arises, because, depending upon the specific circumstances, it is often not possible to set up a trust after a claim arises. To be clear: in this case the claim arose when the loan went into default. The bank won the case in January 2013, and the Court entered a final judgment against Mr. Bellinger for $4,923,797.57, plus post-judgment interest. The bank then sought to collect its judgment from Mr. Bellinger, but was unable to do so. Mr. Bellinger, as ordered by the Court, requested the Cook Islands trustee to send back all of the funds in the Trust to pay the judgment. The trustee considered his request and refused. The bank then asked the Court to incarcerate Mr. Bellinger for contempt, pointing out that “[p]rior to the entry of the final judgment, but several months after [Plaintiff] filed [its] lawsuit, Bellinger created an offshore Cook Islands Trust.” The bank alleged that “Bellinger created the Cook Islands Trust in order to shield his assets from the final judgment that was ultimately entered against him by this Court.” The bank further asserted that Mr. Bellinger could not argue that it was impossible for him to comply with the final judgment because, by creating the Trust, his inability to comply was self-created. In opposition to the bank’s motion to have him incarcerated, Mr. Bellinger argued that the bank was overreaching by seeking to have him incarcerated because he lacked the financial ability to pay the monetary judgment entered against him. In response to the bank’s argument that the Solow case (APN, Vol. XIX, No. 1) should be controlling, Mr. Bellinger argued that his case was not a disgorgement action seeking the refund of wrongfully-obtained funds (as in Solow), but rather a garden variety civil action on a personal guaranty following a failed commercial loan. Mr. Bellinger argued that the Trust was lawfully created before any final judgment was entered against him, and that the bank was improperly seeking to have him held in contempt because he was unable to pay a civil judgment. Additionally, Mr. Bellinger argued that he should not be held in contempt because he lacked the power to have assets released from the Trust in order to comply with the final judgment. Mr. Bellinger explained that he established the Trust because he had recently been divorced, needed to revise and update his estate planning (quite customary), and, in particular, he wanted his updated estate planning to assure the financial security of his daughter (who was in need of financial assistance). Mr. Bellinger testified that he could not compel payment of the judgment from the Trust (he had asked and the trustee refused), that he could not replace the trustee, and that the Trust was irrevocable. The Court found Mr. Bellinger to be a credible witness, and the Court concluded that he had adequately shown an inability to comply with its final judgment. It is noteworthy that from March 2012 to May 2013, Mr. Bellinger had received a monthly distribution from the Trust which he used to cover “overhead costs of [his] support.” After May 2013, such monthly trust distributions were made to Mr. Bellinger’s girlfriend (who was also a discretionary beneficiary of the Trust). Thus, he was able to benefit from his Trust while the creditor was trying to reach his assets – not possible with a domestic trust. In reaching its decision, the Court correctly relied on the controlling U.S. Supreme Court case of Maggio v. Zeitz: “Civil contempt orders are coercive in nature. … “To jail one for contempt for omitting an act he is powerless to perform would reverse [that] principle and make the proceeding purely punitive, to describe it charitably. Contempt orders will not be issued if the court finds no willful disobedience but only an inability to comply.” (emphasis added) (See, APN Vol. XVII, No. 1) Mr. Bellinger was (properly) not held in contempt. ONE MORE THING. The Court stated that the bank appeared to assert a fraudulent transfer allegation in support of its contempt motion. However, even if the bank had successfully argued and won a fraudulent transfer argument, it would have been to no avail. Consider this: since the trustee refused to return trust assets when Mr. Bellinger was faced with contempt incarceration, it is very likely to have refused to honor a “return the assets” order of a U.S. federal court. After all, no U.S. court has jurisdiction (power) over a Cook Islands trustee (as it would with a domestic trustee), and, in order for any fraudulent transfer finding to have effect, a court must have jurisdiction over the transferee (in this case, the trustee) so it can enforce its return order with threats of sanctions. SUMMARY. Court decisions have consistently held that civil contempt incarceration can only be used to obtain compliance with a court order – it cannot be used to punish, and, it can only be used when the party subject to the court order has the present ability to comply. Incarcerating a party for failing to comply with an order which is impossible to comply with is punishment and, under the long-standing law set forth by the U.S. Supreme Court, cannot be done.